Pearl Jam frontman and diehard Chicago Cubs fan Eddie Vedder makes a guest appearance in a new Major League Baseball commercial for the team. 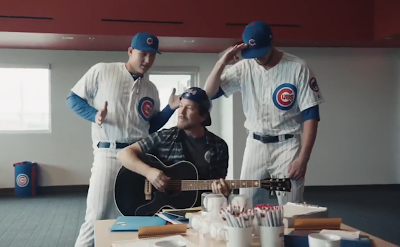 The rocker joins sluggers Kris Bryant and Anthony Rizzo – and several other Cubs – in the latest in a series of ads for their fake company, Bryzzo, which delivers souvenir baseballs to fans via home runs. Timed to arrive during MLB’s 2017 opening weekend, Vedder tests out some jingles on the pair as they expect business to ramp up following last year’s World Series title after a century-long drought. “ThisSeason on Baseball: The #Bryzzo Souvenir Company is getting bigger and better,” tweeted MLB alongside the new video. Vedder followed the Cubs throughout last year’s playoffs, even performing “Take Me Out To The Ball Game” during the seventh-inning stretch at Game 5 of the series between the Cubs and the Cleveland Indians. Pearl Jam played two shows at Wrigley Field last August: on night one, Vedder dedicated a song to Gord Downie of The Tragically Hip following his diagnosis of terminal brain cancer, and ejected a fan on night two after the rocker spotted him allegedly being abusive to other concertgoers. On April 7 at New York’s Barclays Center, longtime associate Neil Young will induct Vedder and Pearl Jam into the Rock And Roll Hall Of Fame alongside fellow honorees Journey, the Electric Light Orchestra, Yes, Joan Baez and Tupac Shakur.